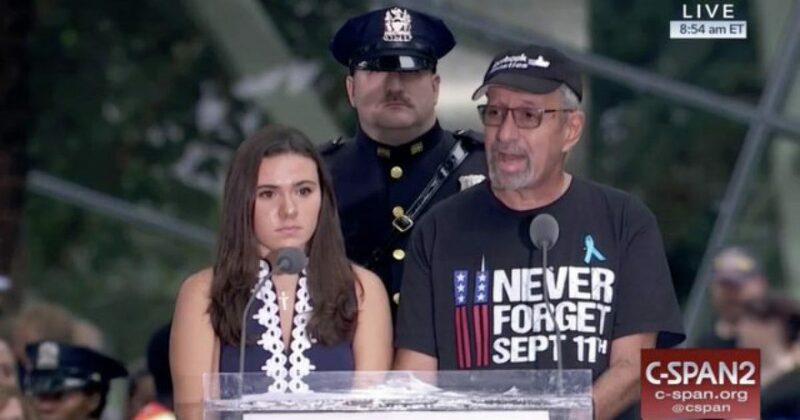 Haros Jr. spoke at a memorial service held on ground zero on Tuesday, the 17th anniversary of the attacks, where he put House Minority Leader Nancy Pelosi and Sen. Cory Booker on blast for using his mother’s murder for the sake of pushing their own political agenda. Haros was one of several people who read the names of New York victims during Tuesday’s memorial service. After reading his mother’s name, Haros explained his grievance. “This year, a representative of the House referred to our loss as ‘just another incident.’ This year, a network commentator said the president’s performance in Helsinki was as ‘traitorous act’ as was 9/11. And last week, a senator attacked a Supreme Court nominee and called him a racist for alleged comments after 9/11,” Haros explained. Haros’ request was met with resounding applause. The comments from Pelosi took place during her weekly press conference the week of July 26, where she referred to the attack as an “incident.” She was doing her usual anti-Trump pushback, attempting to debunk the president’s claim that Democrats were total weak sauce when it came to border security. They are by the way. We have a responsibility to protect our borders. All of our borders. Let’s make no mistake about that. Democrats have been strong on that point. All of our borders. In fact, I said to some of you before, when we had the 9/11 incident and the commission was formed — and they made their recommendations — they made recommendations to protect America, but the Republicans would never take them up. And some of it was about our borders. The Republicans would never take them up. This is one of many things that makes liberalism an utterly disgusting ideology to hold to. According to the whole “Rules for Radicals” junk, you should never ever let a good tragedy go to waste. Meaning, whenever something really bad happens, exploit it for the good of your political agenda, regardless of how it might make others feel. They manipulate people into thinking they care about others, about fairness and equality, but the truth is, they only want power. They have an insatiable appetite for it. Let’s hope Haros’ words don’t fall on deaf ears and the left actually takes what this man said to heart. Some things are beyond politicization.